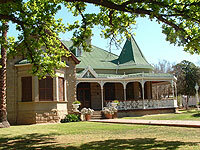 This beautiful Art Nouveau manor house was designed in 1907 by Mr Bullock for Robert Sladowski, a Jewish merchant of Oudtshoorn. The building was built of local sandstone by a contractor, J.T. Cooper (Jnr). The roof line is broken by an octagonal-pointed spire steeple covered with fish-scale tiles. The base of the steeple is partially surrounded by cast-iron fretwork and on the top is a decorated spike. The bargeboard of the front gable is of beautiful dragon-design carpenter’s lace. A curved verandah is supported by decorated cast-iron poles, fretwork brackets and spandrels. A false portico is above the flight of steps to the main entrance. The wooden stoep is enclosed by cast-iron fretwork railings. Below the gable is an extension of the main bedroom partly covered with fish-scale tiles and a false parapet of cast-iron fretwork. The four fireplaces each designed in a period art style and decorated with tiles, mirrors and Art Nouveau brasswork and encatchments, give evidence of plenty of money during Oudtshoorn’s feather-boom period. The ceiling of one of the bedrooms is of papier-mache in the French Rococo style. The dwelling now owned by Mr Andrew de Jager, is in the middle of one of the original water plots. An oak tree on one side of the front garden creates an atmosphere of peacefulness near a busy road to the Cango Caves. The wildebeest can travel upwards of 1,500 kilometres per year.